Many people have visited a tropical location and seen a beautiful garden that was loaded with palm trees and other tropical plants. They will fondly recall a very good feeling they had about this garden. It might have been at a hotel, park, private residence or a botanical garden. One might have even seen such a garden at a shopping mall or business. It was lush and inviting. It displayed vivid images of unusual plants, different textures and sizes, different colors and a whole array of unusual species. And, almost every time, palms were a major part of this landscape. Palm tree gardens are not unusual in tropical and temperate climate zones. After viewing one, it is not unusual for someone to say "I'd like to do this at my home". Or, "I wonder if I can grow some of these plants?" They might be on a trip and want to "take their vacation" home with them. It is not unusual that people will call us and ask about a specific species that they liked when on a trip. Sometimes people will ask how they can design and grow a backyard garden just like they saw in Hawaii. It can be done quite easily. This article will help your journey from the inception, the dream of having a beautiful palm garden to actually having one. But, there are some simple rules to follow and it is useful to have a plan about what you are doing. Below you will find information about getting started on this goal and pursuing it until you have that tropical oasis at your home or business. For those who are well on their way to having a mature garden, some of this information will be unneeded or repetitive. But, our goal is to help everyone, especially newcomers to create a garden that they love. Palm trees are almost always part of a tropical landscape design. People have been intrigued and fascinated by palms for centuries. It's almost like there's something magical about palms. This even dates back to the era of Colonization where explorers would return with exotic palms as gifts for their sponsoring government or royalty. 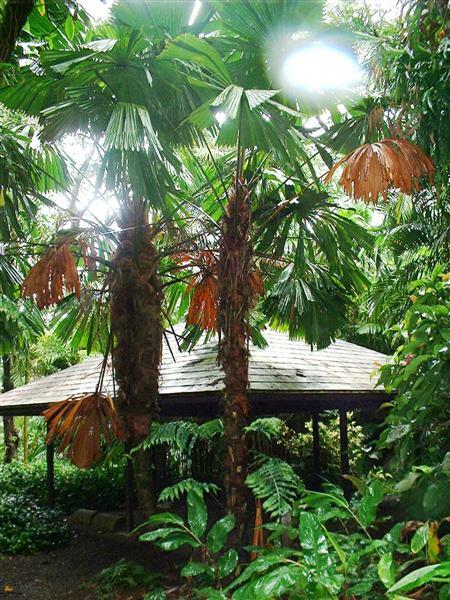 Today, many of the major botanical gardens at universities and public arboretums in temperate or warmer areas worldwide have a palm tree garden or palms as a major part of their landscape. If you survey people about what plant group belongs most in a tropical landscape, the majority say "palm trees". Palms come in all sizes, from short to tall. And, all are a bit different. Thus, when properly chosen they give a very broad palate of different appearing plants. Some have thin trunks, some fat. Some are swollen at the base, others bulge in the middle of the trunk. Some have leaves that are almost entire (no divisions) and round. Others have long feather like leaves. Some show colors of the rainbow. When mixed together in just the right fashion, one gets a stunning effect. And, usage of the right companion plants along with the palms finishes the job. Even for the smallest of yards, a well designed palm garden can be very dramatic and impressive. Also, a nice thing about palms is that they are clean plants, fairly easy to grow and low maintenance. Some species are "self-pruning", meaning the old leaves just fall to the ground without pruning. Any concern about seeds can be eliminated by removing young blossoms. Compared to most tree species, palms are less work and the roots are seldom invasive to structures. Finally, many palms are fast growing. It is not unusual for palm gardens to mature in a matter of five to ten years. Probably the most important aspect of getting started with your palm garden is to develop an interest in palm trees themselves. Start looking at them as you drive through neighborhoods. As you learn more about palms, your affinity for them will increase. You'll find it interesting to see a new species that you hadn't noticed before. Try to identify palms if you can. Use palm reference books or the Internet to help you do this. Try to figure out which species you like. Take photos of plants you see and like. As you tour neighborhoods looking at plants, consider knocking on doors and visiting people who have stunning yards with palm trees. They will typically welcome the interest in their yard. They could be quite helpful in guiding your efforts. Even if you don't have the courage for this, do look at palms in peoples' yards as you drive around. You'll quickly find out that there are at least a dozen species you see commonly and are quite sure you can grow. If you live in an area where few people grow palms, you will probably be more dependent on the Internet or reference books. But, do check for palm enthusiasts in your area. People are usually amazed to find out that there are over 3000 different species of palms. Of course, all these species cannot be grown in any one given locality. But, there are a lot that do survive in many temperate or warmer areas. It's not unusual for palm gardens in Southern California to have over 100 different species of palms growing on the property. With little effort and by just driving around, you might come up with several dozen species you like over time. And, if you find an enthusiast's garden the number will dramatically increase. The point here is to expand what you know and then decide the species you like. One of the traps is to just give up and use ordinary species you see everywhere. This is a mistake. If you go this route, your future interest in the garden will be minimal and your resulting garden will not be as interesting or appealing. Now that you've seen some palms, make a list of species that you like. Take photographs of palms that you like. On a family outing, include some "palm viewing" as part of the day. Perhaps you can train your spouse to be a "palm spotter". It is actually quite fun and kids love it. You'd be surprised what you'll see by just driving around. Don't forget to take a look at public parks and arboretums if they are around. Talk to others. But remember that, to get a great garden, you will need a personal blend of excitement, courage, enthusiasm, willingness to try something different, resolution and perseverance. In making this list, decide on the plants you've seen and really like. Next, force yourself to consider some plants that are new to you and different looking. As an example, I've been growing palms for over 30 years and I can tell you that over 90% of beginners only want to grow "feather palms" (as opposed to fan palms). So, if you are one of this majority, you'll probably find yourself gravitating toward the feather or pinnate type of palm tree. Remarkably, some of the most exotic palms in the world are fan palms. If you just grow feather palms, your garden will lack the diversity and charm it could have. So, try different species. Keep looking until you find ones that really charm you. Consider species that are short, species that are tall, species that have unique colors and for sure some fan palms. Did you know that the only palm species native to Hawaii are fan palms? Everything else was introduced by man after inhabitation. As time goes by, you'll see how all the diversity described above accentuates the charm of your project. Another point I want to make is to trust your own judgment as you attain more knowledge. You will become an expert over time. Sometimes hired "experts" such as landscape architects and contractors have a very limited knowledge of palm trees, especially unusual species. Yes, on their plans they have called for or planted thousands of them. But, they are typically only using those common species that have worked for them before. The common Queen Palm and Mexican Fan Palms are examples of commonly used species. There are so many more interesting species that could make landscape more interesting. Most of these professionals usually do not consider themselves experts when it comes to the selection of or growing of palms. They've got a lot of other things that occupy their time. You will find that, as time goes by, your will be the "expert" more than them. Trust your opinion as to what you like and want to use in your yard. I've written an article on this concept elsewhere called "The Most Important Thing In Landscape". It emphasizes that the important thing in landscape is the plants, not the hardscape. If you dedicate yourself to the project, you'll find that contractors and architects will be amazed "at what you did"! If you don't have time to dedicate yourself to your project, then make sure you hire someone who either has the knowledge and enthusiasm himself or is willing to call in a palm expert to guide him. Over a rather short period of time, you will develop a list of the species you like. These could be either for your front yard landscape or the back yard. And, you may have utilized books or the net to expand your list. It's not unusual for people to see photos of palms they like and seek out to get those selected species. But, you must first realize that there are cultural points that limit your selection. To be successful, you have to know the needs of the plants. All palms probably won't grow in your area. The next section of this article goes over factors that will help you select the species that will thrive in your particular area. As mentioned above, designers, architects and contractors tend to use the same palm species over and over. This includes the common Queen Palm, the Mexican Fan Palm and the Pygmy Date Palm. If you go outside and look down the street, undoubtedly you'll see these planted near you if you live in a palm growing area. You don't have to use these palms. It's really not any more expensive to use interesting, different palms. The final result if you diversify will be a more interesting and enjoyable garden. Below are some common palms that you see everywhere. No matter where you live, there will be limitations on what species of palm trees you can grow. These are things to consider as you select more species for your palm garden. Factors that determine what you can grow include your local weather, winter cold temperatures, the intensity of your sun, humidity, etc. of these, by far the most important factor is the cold you see during your winter. Cold seen during the winter is the most limiting factor influencing what species you can grow. Everyone is familiar with "garden zones". These "zones" are a simplistic way of telling you what can be grown in your area. They were constructed off predictable low temperatures in any given area. Unfortunately, zones are inherently flawed and often misleading. More important is actually knowing the temperature seen on your coldest nights. Most palm enthusiasts think in terms of cold temperatures, not zones. Knowing how cold you get can give you a prediction of your success as you try new species. Most specialty nurseryman have a good knowledge of the cold tolerance of different species. We think in terms of "degrees", not "zones". There are even monographs and books written on this subject. To determine your coldest temperatures, review municipal weather records or purchase a maximum/minimum thermometers. Over time you'll be quite knowledgeable about your areas cold weather. If you live in a colder area, you must pay even more attention to the temperatures you see. Many species do not like cold weather. If you live in an area where it essentially never freezes, you are not only fortunate but will have an endless choice of different species to grow. If you see temperatures in the mid-twenties F, you have to use care in selecting species. But, there is an ample number of palms that tolerate these temperatures. However, if you see 15 degrees F. or less, you can only choose from a limited list of species. This will include perhaps ten or twelve different types of palms. Numbers of species possible in these colder areas is expanded if one utilizes methods of cold protection. Below are a few palm species that do not perform well in Southern California. Our winters will kill them. Of good news to some of you, there are many species that prefer cooler climates and grow poorly in the tropics. And, a lot of others that live in both areas. This includes many species we grow in in Southern California. For the palms that prefer cool weather, this is often because they come from a cooler natural habitat in the wild. Such areas would include species native to the Andes or New Zealand. 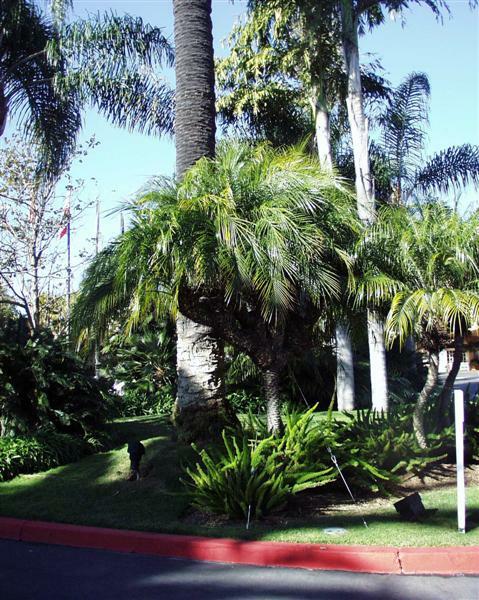 The photographs below show three palms that thrive in Southern California but have difficulty in more tropical areas. People who live in the desert may not see bitter cold during the winter. But, they routinely experience extremely intense sun. In areas such as Phoenix, AZ or Palm Springs, CA, this is the case. Their winter low temperatures are not that bad, but the "coastal sun palms" can wither with their sun. To solve this problem there are two things that can be done. First is to only select species that thrive with this intense sun if they are to be planted into full sun. There are quite a few palms that thrive in hot desert sun. Secondly, consider over time developing garden canopy or shade. Surprisingly, if you block those intense sun rays with overhead canopy, many of the coastal species do fine with overhead protection. If this is not possible, limit the sun exposure by giving only morning sun or brief periods of sun. This limitation of the amount of sunlight hitting the palms greatly expands the list of species one can grow in such areas. Also, remember that water requirements might be much greater if you are in a hot and dry climate. Below are six examples of palms that thrive in hot desert sun. When we talk about humidity, it mostly applies to the amount of water in the ambient air. But, one also looks at the amount of water in the soil. Everyone knows about the hot, humid days in the Gulf States area and Florida. This does cause problems for some palm species like Brahea armata, the Mexican Blue Fan Palm. Some plants enjoy the high humidity, others don't. So, one must select species that fit your area. If one has an area of the garden where to soil is excessively wet all the time, one must select species that like these wet soil conditions. An example would be Accoelorrhaphe wrightii which enjoys moist soil. Leaves that are more fragile do poorly with high wind conditions. If a species has stiff, strong leaf structure, it typically does better with high winds. But, genera such as Caryota or Pritchardia can tear in strong wind. Companion plants like Banana and the Traveler Palm also have trouble with strong winds. So, if you see a lot of strong wind, select species that tolerate the wind. Properties located directly on the ocean sometimes see salty air conditions. Some species of palms, like Ravenea rivularis, do poorly with the salty air, especially during the winter. Foxtail palms also show brown tipping of leaves when close to the ocean. However, there are many species that can thrive right on the water's edge. 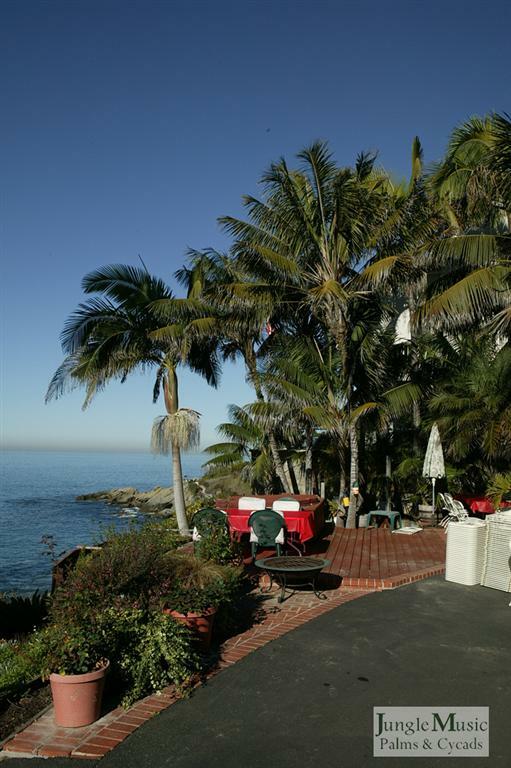 If you have a waterfront property, especially on the western coast of California where there is surf, it might be worth your while to have a palm specialist guide your selections. The first two photos below show two palms that perform poorly right on the ocean. Now that you understand that there are limitations on what species you can select, you can now begin to expand the list of species that you can potentially grow. And, you want to know where to locate your favorite species when you are ready. Below are different methods of getting ideas and finding plants. Remember, diversity of species creates visual interest. If you are reading this, you are an Internet person. This is usually where people begin. There are quite a few good websites on palms. Try to find one that gives you information, not just a sales pitch. Look for articles that expand your knowledge and seem reputable. Try not to get overwhelmed, a common occurrence when beginning. Regarding websites on palms, we are proud of the content of our website, Jungle Music Palms and Cycads. It is world acclaimed because its goal is to share information. But, there are other sites that do a good job of this as well. Remember, there are over 3000 different species of palm trees. Make sure any website you read has information that applies to your locality. Reference books are a great resource. Nothing is easier than thumbing through a good text and looking at pictures. One of my favorites is "An Encyclopedia of Cultivated Palms" by the late Robert Riffle and Paul Craft. There are actually quite a few good palm books. But, such reference books have their strengths and limitations. The strength of reference books is typically their descriptions of the species and photographs. But, accurate local cultural information is often skimpy or nonexistent. Most importantly, you want to know "will this species live in my garden?". Unfortunately, most palm reference books lack any meaningful information on growing a given species in different localities. Cultural advice given is typically quite general. Terms such as "good for temperate or subtropical climates" is about all you'll read. This is because an author cannot write text that addresses everyone's growing environment. It would be nearly impossible to write such a book. So, you can learn what a species looks like but only get a "hunch" as to whether you can grow it. This same limitation may also be seen in articles on the Net. If a friend or associate is in your area, he will be a great source of information for you. This is a very good means of acquiring knowledge, especially if such a person has tried a lot of species in your locality. A person who has "been there and done that" can give you a lot of good pointers. And, you can visit his garden and see the results he's had with various unusual plants. It's also a great way to make new acquaintances. Remember above I proposed that you "knock on the door" of someone with a beautiful garden. He can also advise you of nurseries that supply quality plant material in your area. A neighborhood palm garden who'd show you around. knock on the door and ask if this person for advice. If you stopped in on the owner of this garden, he would willingly give you a tour and you'd learn what to plant. Most enthusiasts rapidly discover that finding desirable species of palms is not as easy as they first thought. This is usually because they have not visited a nursery that specializes in palms. I might first mention the difference between a general nursery and a specialty nursery. General nurseries sell a little of everything. They are not experts typically with any given group of plants. Specialty nursery usually just grow certain groups of plants. And, typically their knowledge of these plants is far greater about those plants than you'd experience in a general nursery. 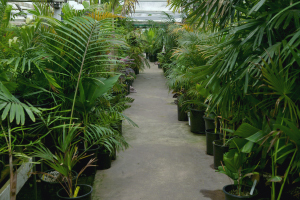 For instance, our nursery specializes in palms, cycads and tropical plants. And, we have had a lot of experience with these groups of plants. We can't give nearly the same degree of advice when it comes to things like roses, pony packs of flowers, or citrus trees. Although general nurseries are much more prevalent in communities, most enthusiasts eventually seek out a palm specialty nursery. And, when you find such a specialty nursery, I'd recommend one that propagates palms right there at the nursery. This is opposed to a "broker" who is selling someone else's plants. Such brokered plants are often imported from more tropical areas and are prone to problems. If you see plants of all sizes, little to big, at a nursery, the chances are this is a propagating nursery. Such nurserymen usually have a lot more experience with the species and advice you get will be more reliable and accurate. Such nursery owners or staff can be of tremendous help to you. They'll readily have information about any species that you inquire about. They'll most likely know whether or not you can grow a given species. And, most will propagate species that will live in the locality of the nursery. Oppose this to a brokered in palm that "might" survive. When a new client comes into our nursery, the first thing we do is ask them Where do you live?". The reason for this is that we probably know the cultural limits of his or her locality. Other questions we ask are "What are you trying to accomplish?, "Are there view issues? ", "Nosey neighbors? ", "Drainage problems? ", etc. Once we get this information we can give meaningful ideas to the customer. You'll find this at most quality specialty nurseries. It would be very rare to get such information and guidance from a general nursery. Another major benefit to a specialty nursery is the selection of species available. Rather than five or six species, typically hundreds of different species are being grown and sold. 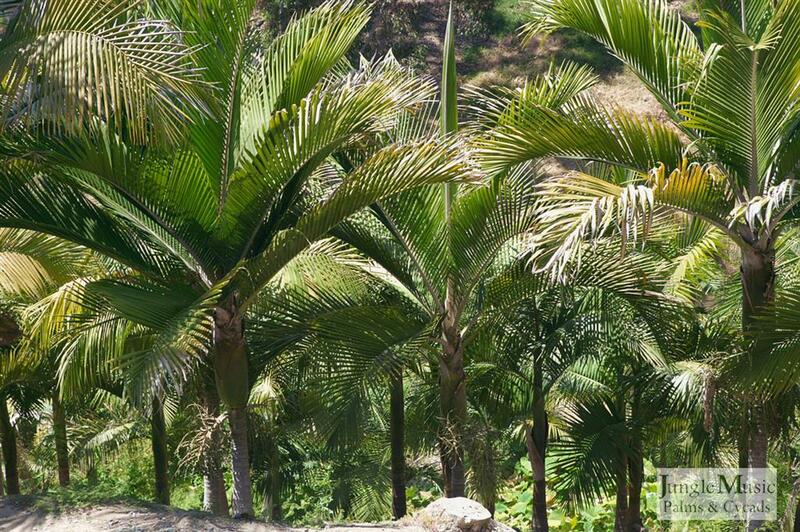 We grow about 850 species of palms. It's hard for a nurseryman to offer advice about species if he's never even tried to grow different species. At our nursery, Jungle Music, I think we've tried about every possible species imaginable. And, after over 40 years, we pretty much know our stuff about survivability of species in any given area. Below are a few photos of palms at our nursery. The title of this section might take you by surprise, but "predictability" is a very important characteristic of palms. What do I mean? What is meant is that, if you successfully grow any given species, you can predict what it will look like when it is mature. This fact is quite useful to the palm enthusiast. You can easily fit a given species into your plans. For instance, if you grow a Caryota urens, a Fishtail Palm, it is predictable what it is going to look like. It will have a thick trunk, be very tall, have long leaves, and a huge crown size. So, a Caryota would need some space and room. Oppose this to the species Chamaedorea geonomiformis, a dwarf shade palm, rarely over 2 feet tall. This species easily fits into an understory area with limited room. Dypsis decaryi (Triangle Palm) is in-between, getting to a height of about 20 feet. This is why palm books come in handy. The nurseryman says "you can grow this". The book shows you what it will look like if you grow it correctly. Because palms are predictable, you "fit" a given species that you like into your design. In contrast, many other trees have a wide diversity of mature sizes depending on their culture, care and pruning. As an example, you could find two Ficus nitida of comparable age: one is huge and the other is small from pruning and culture. It is not possible to "prune palms to be small". Yes, you can thin out suckers or stems. But, a palm is going to mature into that predictable appearance you see in the book. Cutting off the top crown will kill it. Poor culture can stunt a palm, but if treated well and in the proper climate, it has a predictable look when mature. Another interesting thing is that once a palm starts to get big and displays its crown size and trunk, these typically don't change much over time. The plant just gets taller. Contrast this to the Ficus above that increases not only its trunk size dramatically but also the width of the crown. In my experience, most palm enthusiasts have a vague plan for their garden but not a precise one. They don't have an intricate design with every species dedicated to a given spot. And, it develops over time and is coordinated with the availability of manpower, resources and finances. One might get five or ten plants and put them "here and there". Later such a person gets some more and adds them to the garden. Thus, it is more of a "work in progress" for most people. Contrast this with a landscape architect who will almost always deliver a set of plans that calls for every plant in every location. As mentioned previously, the plants chosen with plans are typically from a cookie-cutter program and boring and routine species. With this said, however, there are some people who, by themselves, want to plan out the entire garden and buy all their plants at one time. If financial resources permit, this is a great way to do it because your entire garden will be growing from day one. Regardless of which technique you utilize, there are some general suggestions below that one might consider. This includes things (in my opinion) that are the "do's" and "don'ts" when designing your palm garden. Consider first putting in species that will eventually become your upper canopy. Canopies are horizontal layers of the garden. Typically people talk about the "upper" canopy of plants. These are the plants that are tallest in your garden. This upper area will create shade for the lower growing palms and also give winter warmth below. They'll also provide you some relief from the sun on a hot day. These upper canopy forming palms are mostly the larger species like Archontophoenix, Roystonea, Ravenea, Syagrus, Caryota, etc. Upper canopy species are typically quick growing and satisfying. One gets results right away. Also, they allow the enthusiast to try lots of desirable species below because of the sun and cold protection that develops. Put taller species toward the back and shorter, smaller species toward the front. This makes it easier to see the entire garden as you walk around. You can put a few large trunked species by the walkway if you like the idea of "slapping a trunk" as you walk by. But putting small species way in the back means they will hardly ever be seen. Use the best soil you can purchase or amend your soil as soon as you start. Never buy cheap fill soil for your garden as you can never easily replace it. Soil is one of the most important cultural aspects of your garden. Mulching any soil adds nutrition and drainage to your soil. Put suckering species, especially larger suckering species like Phoenix reclinata, in an open area or toward the perimeter of the garden. A thick, multi-stemmed specimen right next to your walkway will totally obstruct your looking to the plantings behind it. 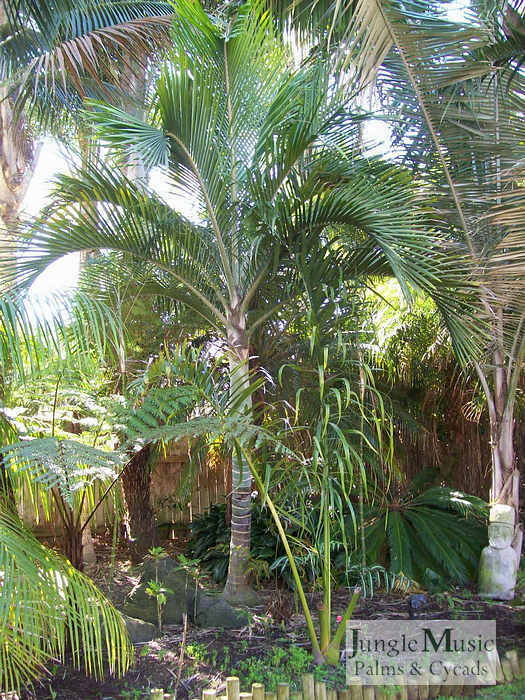 Example of a large plant toward the back or perimeter of the garden. Avoid putting plants with dangerous spines close to a walkway. The reason for this is obvious. Yet, many people put that Pygmy Date Palm right next to the walkway where spines eventually will be right at eye level. Put suckering species or a grouping of a single trunk species in an area where you wish to block visibility into your yard. A biological fence is a great way to block the view of a nosey neighbor looking over the fence at your spa. Plants ideal for this include such things as Dypsis lutescens, Arenga engleri, other species of Dypsis and clusters of Howea forsteriana. Consider the shade produced by plants you are putting into the ground. Many people like to utilize palms to create shade. It offers a cooler environment and expands the list of species one can grow near the ground. But, sometimes it can work against you if it shades out a smaller adjacent plant that demands sun. Or, this shade might be undesirable if it hits right onto your swimming pool. Think about the path of the sun and the shade created over time. As a palm is predictable, you can predict future shade. Plant species in the correct amount of light. When you purchase species, make sure you understand which ones like full sun and which species like shade. Also consider the shade produced by the surrounding garden. Created shade can stunt a sun-loving species. Most Chamaedorea and Licuala won't like full sun locations. Chamaedorea ernesti-augusti does poorly in full sun. If you have a small, one story house, don't overwhelm it with a whole army of towering palms. If you must have those tall palms, put most of them away from the house. 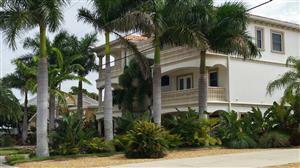 You might consider smaller species close to the house and the bigger palms planted toward the perimeter of the property. Remember to acclimate your palms to your locality. You might live in a much hotter or brighter area than where you purchased your plants. Acclimation can be accomplished easily. There are articles at this site on acclimation. Consider the density of your planting. Remember, palms are predictable. You know how big they are going to be. Plan and plant accordingly. Different people like different densities to their garden. It's an individual aesthetic decision, different from person to person. By knowing what they are "going to look like", you can determine the density of the garden from the onset. Try to give plants adequate room for good culture and space them correctly. If you are having open lawn areas and want to add palms in this area, pick species that will be large and stately when mature. This would include such species as Bismarckia, Archontophoenix, Phoenix, Sabals, etc. 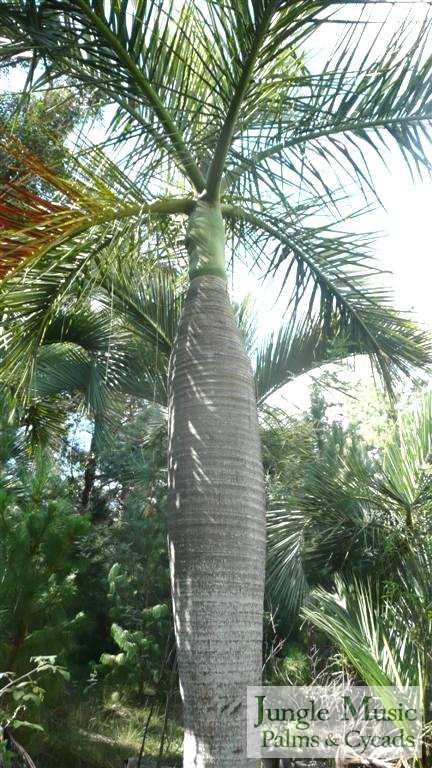 The lawn around such specimens will give a good opportunity for viewing the large palms. Typically dwarf species just don't look right in the middle of a large lawn. The blue Bismarckia nobilis wants room to grow. This Sabal causiarum also needs an open space. Remember not to block an important view from your house or your neighbor's home. If you are on a hillside above the ocean, trust that your giant Caryota will draw comments from the neighbor behind you. Be considerate of your spouse and neighbors; plant the right species in the proper location if a view is important. As hinted about above, think of your new palm garden in layers. By this I mean different horizontal layers of plant crowns as one examines the garden over the vertical axis. Some species stay small, others get quite tall. One has the taller canopy forming species as described above. Then there are the mid-level species like most Pritchardia, many Dypsis, Pinanga, Hedyscepe, etc. And, near the garden floor are the smallest palms like some Chamaedorea, Licuala, etc. Remember to leave room between the canopy formers for these very interesting smaller species. Plan where you are going to put walkways and lookout points in the garden. You don't want to plant a lot of palms in your garden and not be able to see them. Design the garden layout of plants so that you can see the majority of plants as you walk through pathways. Decks for viewing the garden can be very desirable. If you are growing species that demand shade, don't plant them in an area where they will get taller and then will be in full sun. Consider placing them below taller plants that will always be overhead. A shade loving species that "pierces the canopy" will often succumb. Also, don't forget that the shade producing plants can get tall and no longer provide shade below. Always pick out species right for your growing area. The most important factor in determining success are you winter's coldest temperatures. Sometimes your summer heat will enter into the equation, but for desert interior areas, it's more a question of sun tolerance. If you live in a cold area, read our article on Cold Hardy Palms. Avoid overuse of any given species. Despite seeing Queen palms at an inexpensive price, resist the temptation of overplanting too many of them just because they are affordable. If you do, you might find that the later cost of removing them far outweighs the savings when purchased. Also, too many of the same species is boring. Add diversity and expand the species chosen. It will be more fun for you in the long run. For cost effectiveness, consider getting the largest palms you can afford without necessitating heavy equipment. Very large specimen plants are typically very expensive to install. 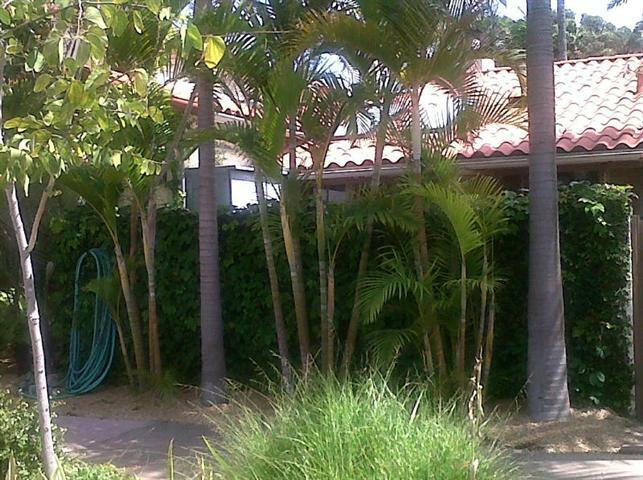 As many palms are fast growing, consider the biggest one you can get without paying high installation prices. this might be a 20 gallon pot or a 24 inch box. Boxes bigger than 30 inches demand cranes or tractors with high overhead. Palms do grow quickly and you can save a lot of money over time by merely being patient and planting smaller specimens. If you have a very small yard, a small patio or a narrow area, use the appropriate species. In such an area, a large palm such as the Pheonix canariensis above would be a big mistake. Good choices may be species of Dypsis, Chamaedorea, Rhapis, or other smaller trunked genera. If you are planting in a very thin area, certain species work better than others. If you are planning to crane in some major specimens, do this first. Then add the smaller plants so that moving equipment doesn't damage the smaller plants. Do remember that sometimes the cost of one of the major craned in specimens can pay essentially all the other plant material for the garden. And, often you have a "big" specimen of a fairly common plant. So, think about the cost effectiveness of such purchases and whether, over the long run, if that is what you really want. Consider using mounds or raised planters in your garden to show different elevations. This gives a very nice effect to the garden. Rocks or stones can be used to build up an area. If poor drainage exists, this can also elevate plants above the poor draining soil. Some choose to use constructed walls to accomplish this. Consider planting species in groups or multiples. Many palm species, and especially those with thin trunks, look great if planted in a small colony. This "multiple" planting is commonly used with King palms, Howea forsteriana (Kentia Palms), many Chamaedorea palms, and even Foxtail Palms. Most likely you'll get a "stair stepping" of the heights of the plants in the combination. This can be very appealing. Consider water features such as a pool, fountains, waterfalls, or streams; and consider palms and cycads to decorate them. They blend superbly. Palms are very nice around a pool or spa. And cycads are nice when placed away from walkways. This is because they don't get overly large. The right combination of palms can really draw attention tot he water features. This is one of the most important points I wish to make in this article. In a palm garden, it is quite disappointing to see too many of the same species planted over and over again. It basically creates a boring garden. I am not talking here about a colony or grouping of the same species in one area. I am speaking of the over usage of any given species. I mentioned this above with the monotonous usage of Queens and Pygmy Date Palms. Sometimes repetitive planting may be attractive along a street parkway or driveway. But, for general usage in the garden, it should be avoided. Because garden space is a precious entity, don't waste it. Use it wisely and plant diverse species that will become the charm of the garden in the future. Repetitive planting also displays a lack of imagination and creativity. It is true that it takes time and energy to acquire a vast collection of species. But, you will be rewarded over time for your efforts. If you think about it, wouldn't you be disappointed if you went to a botanical garden and all you saw were King Palms and Mexican Fans? Palms are a very diverse group of plants. There are species with huge fan leaves, species with blue color, species with newly emergent red leaves. There are suckering varieties, tall stout trunk species and even miniature dwarf palms that never get over 24 inches in height. There are species that prefer sun and others that excel in low light conditions. There are even species that climb up the trunks of larger overhead hardwood trees. 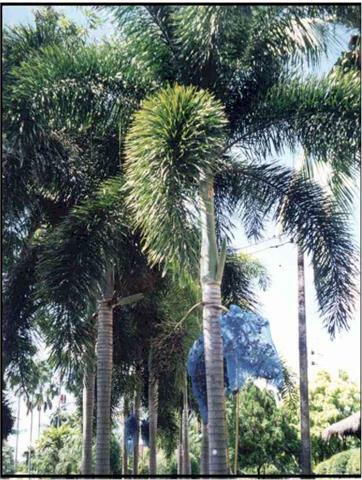 Properly selected, a variety of palms can create a diversity of levels of the canopy and draw attention and interest. I will guarantee you that, if you pursue this challenge and add a lot of diverse species to your project, the garden will become a passion for you. You will be pointing out the unusual species to all your visitors. You only use a limited number of species, your "palm garden" will soon be only landscape to you. You will not experience the thrill of the garden. In Southern California there are easily 200 to 300 species of palms that can be successfully grown. And, each species has its own charm and beauty. 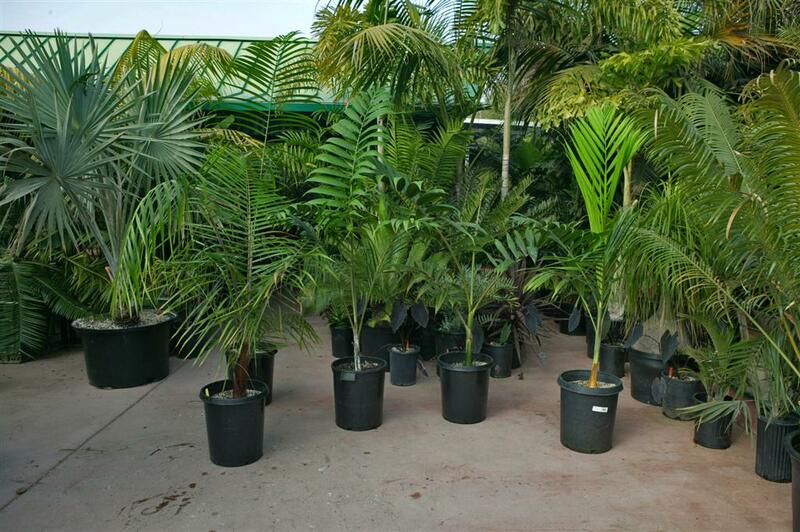 A good palm specialty nursery will be able to offer you a vast array of species for you to grow. Utilize such a nurseryman's knowledge and experience and you will be thankful. Living here in Southern California, it is not unusual for me to see palms planted around a commercial building. In fact, in this locality palms are the number one called for type of plants. This could be surrounding an office building or at a shopping center. Typically such designs are done by a commercial designer or architect and (unfortunately) utilize the most common and sometimes boring species. There is an abundance of Queen Palms, Mexican Fan Palms and in more recent times a lot of Date Palms like Phoenix canariensis and dactylifera. The latter two are certainly more interesting than the first two, but it would be nice to see more imagination in the species utilized. This might be secondary to the ample supply of the common species in larger sizes, but I suspect is also secondary to lack of imagination. Don't allow your personal garden to be similar to a commercial job. Below are two photos of more unusual plantings in commercial or public areas. When you think about it, there is no reason that more unusual species cannot be used, both in domestic and commercial plantings. Just as impressive in such applications would be specimen Bismarckia nobilis or Roystonea regia. Or, Jubaea chilensis or Caryota. In the San Diego area we are fortunate that two hotels, the Catamaran and the Bahia Hotels have used a great variety of palm species on their grounds. And, it is their gardens that drive in occupants. I must admit that availability of large specimens of rare species can be a challenge. But, such species could be mixed among the more common species. Hopefully palm nurserymen will make larger specimens of rare species available in the future. But, for now, we typically have to rely on smaller specimens and wait for them to grow. Particular mention should be made about commercial interior courtyards. 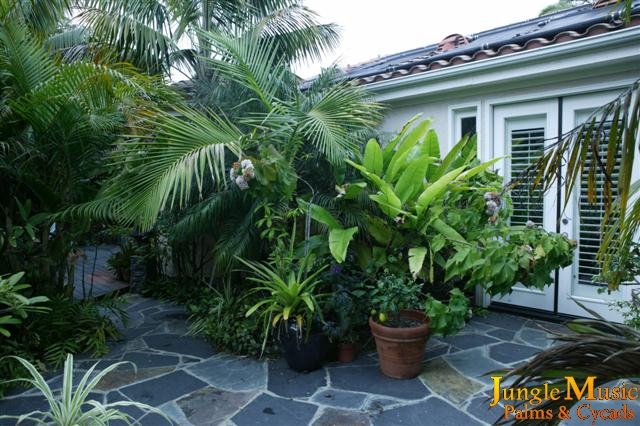 Such areas can be utilized to create a dramatic enclosed commercial palm garden or solarium. This is a great opportunity to use unusual species with sunny effects. I know of a developer that made such an interior tropical palm garden and it greatly improved the quality of his tenants and the rent he could charge for office space. It was designed so offices looked out to the garden. Please see pictures below. Looking out of an office window; what a view! The most beautiful palm gardens don't just utilize palm trees. 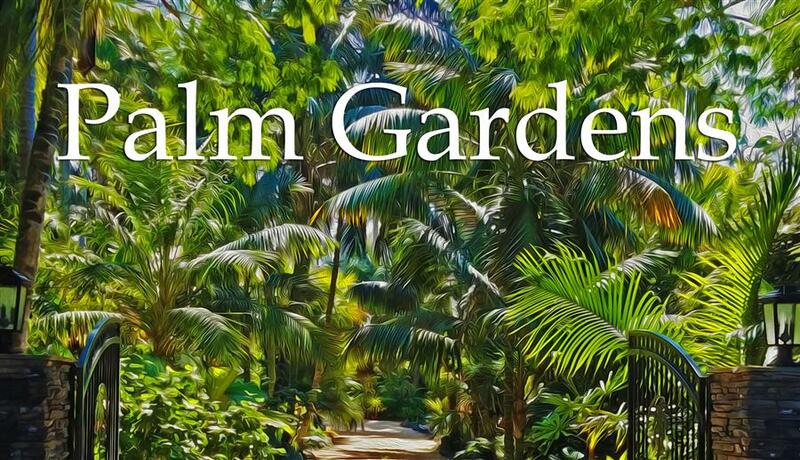 Even the finest palm botanical gardens will use a nice selection of other types of plants to compliment the palms. These are called "companion plants". They actually make the palm specimens look better and many add color to the garden. Soon I will write a lengthy article just on the topic of companion plants. But I will concisely say here that putting in some types of plants other than just palms is well worth your time. Cycads are great addition to any palm garden and used frequently as companion plants to palms. 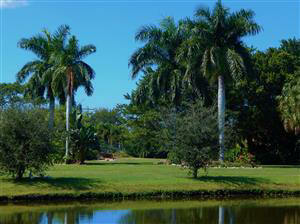 In fact, some of the finest palm gardens in the world also host a nice collections of rare cycads. The reason for their usage is that they seem to resemble palms. But, in fact, they are no way related botanically to palm trees. In terms of their appearance alone, cycads are much smaller than most palms. So, one can use them in the foreground in front of palm trees or in between larger specimen palms. There are both sun and shade loving cycads. And, there are dwarf species as well as a few giant species. Most cycads tolerate similar temperatures as the palms, so there is no more of a cold issue with most of the cycads used in landscape than with the palms. Water and fertilizer requirements are also quite similar, so cycads make the perfect companion plant. They do like good soil drainage. Another nice type of plant to put between the palms and in the shade are types of ferns. Even tall Tree Ferns look great with large palm specimens. Ferns tend to like water, so don't put them into an arid, dry palm garden. Heliconia are another nice plant for a palm garden. They have colorful blossoms. Remember, however, that they sucker and make a somewhat thick grouping of stalks and leaves. Also consider the Screw Pine or types of Pandanus. These have an interesting swirl (screw) of the leaves as they ascend up the trunk. They can get almost as big as some palms. 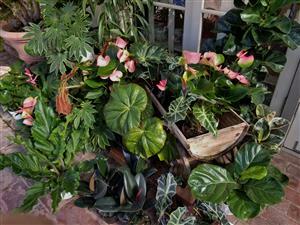 Types of Alocasia and Anthurium also mix well with the palms. If there are cold issues in your locality, get hardy species of Alocasia. 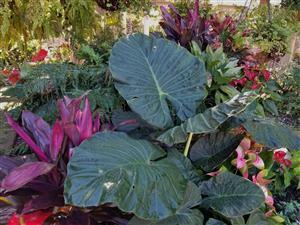 There are interesting dwarf Elephant Ear Alocasia available nowadays that don't overwhelm an area and really compliment the rest of the garden. Also, consider Philodendrons. There are very nice climbing species that look great climbing up the trunks of palms. There are also terrestrial forms that stay on the ground. Also remember to add some color to your palm garden. Certain species of palms such as Chambeyronia throw a beautiful new burgundy colored leaf. But, I am talking about colorful companion plants in this section. 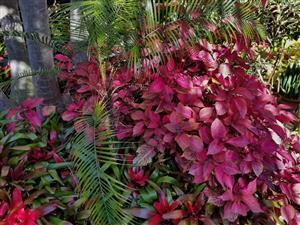 Consider red and pink Bromeliads. Both orchids and bromeliads can be mounted on tree branches, posts or fences. Also, there are wonderful types of Ti's in many colors of the rainbow. Impatience and Begonias are other types of ground hugging colorful plants that blend nicely. Crotons are great but not as cold hardy. Even more common bedding plants can be fun. Be imaginative and find new things that add something to your garden. As I mentioned above, most gardens develop over time. One plants some palms this week and more next month. And, so it goes. But there is one thing that you need to do from the beginning. This is to improve the quality of your soil. This is most easily accomplished by adding organic mulch to the ground in your garden. No matter what stage of development you are with your palm garden, get into the habit of mulching over the surface of the soil. By "mulch" I mean organic material. My favorite is Redwood shavings. Also good are fir or cedar shavings or even mulch or compost from garden debris. You put down an inch or two right on the surface of your garden. You are "carpeting" the floor of the garden with this material. There are many advantages to mulch. These include water conservation, limiting weeds, adding organic material to the soil, improving plant growth, and preventing water runoff. But, the most beneficial effect of mulching is an aesthetic one. The garden will look one hundred percent prettier and more appealing after mulching. You can go to all the trouble to select and plant your palms. But, if below them all you see is dirt and mud, the garden will look incomplete. It won't look finished. It just won't be right. After you put down the shavings, it looks gorgeous, especially if you have used the right companion plants. Many people throw down a slow release fertilizer below the mulch. This helps with nitrogen balance and is kept moist by the mulch. Start doing it and you'll be a believer. Creating and growing an interesting palm garden is not difficult to do. It starts with learning a bit about palms. Then expand your knowledge through books or the Internet. Especially beneficial might be advice from enthusiastic palm acquaintances or from experienced nurserymen at a palm specialty nursery. Specialty nurseries offer a vastly greater selection of species than does the common everyday nursery. Assemble a list of species that you would like to grow. Do consider your own growing conditions and select species that would survive in your area. Choose a wide diversity of species and avoid overuse of any one species. Develop a design with consideration of the species, your space available and any special needs that you may have. Consider interesting companion plants and utilize colors and textures to add interest. Over time and, if you follow guidelines as given above, you will be rewarded with a great palm garden. Enjoy your new project and feel free to contact us about species you seek or help you might need. (10 minutes south of Oceanside, 30 minutes north of San Diego). Exit Leucadia Blvd West (toward ocean).